In the summer of 1907, an English woman, Grace Oakeshott, staged her own death. She left her clothes in a pile on a French beach, discarding them like the skin of a former life, and then she fled with her lover to New Zealand. I was hooked on Grace’s story from the moment I first heard it. Certainly, she was what biographers call ‘an unknown’ but she had done something extraordinary and I could not wait to know more. New Zealand is as far away as you can go from England. Some of Grace’s contemporaries believed it was a kind of paradise, a beautiful Utopia where they could start again and a build a new society free of old world inequalities and social class distinctions. Nowadays, it is still the place most favoured by scriptwriters for ‘The Archers’ whenever a character is due a sabbatical. It is also my home country and as I dug into Grace’s story, I realised that the roots of my interest in her lay deep. Like many of my compatriots, my heritage is mixed. I have Scottish, Irish and English forebears and migration stories are in my blood. I was reared on tales of daring and courage, those of the early travellers and explorers, who like Grace threw caution to the winds and set out to cross the world. As a youngster, I named my troupe of pet guinea pigs ‘Abel Tasman’, ‘Vasco da Gama’ and ‘Captain Cook’. Though I could not have detailed their exploits, the names of the great explorers resonated with me, and still do. Along with many of my generation, I share that migration inheritance and an understanding that my world need not be constrained by the physical boundaries of the country I find myself in. But you don’t have to be a New Zealander to find yourself caught up in Grace’s story. Which of us might not want to start again, to set aside an old life with all its mistakes and wrong turnings and re-invent ourselves? It is harder to achieve now, of course, but in Grace’s time, when communications were slow and unreliable, you had a fighting chance. I initially came across Grace Oakeshott in an academic journal. She had been behind the setting up of the London trade schools for girls in the early 1900s and in her professional life, she was clearly visible. She lived in interesting times, when many women were challenging their inferior social, economic and political status. As a member of the Women’s Industrial Council, she documented working conditions for women, kept minutes of meetings and published reports. I knew such documents were likely to be in the public domain, and I had ready access to them in various London archives. Grace’s colleagues had been devastated to hear of her ‘drowning’ and they recorded their deep sense of loss on several occasions. It only dawned on me that she had not drowned after all when I found online the reviews of a play written by someone claiming to be her great granddaughter in New Zealand. I immediately contacted the playwright. I never doubted the family’s version of events and they could document several of their claims. Slowly I pieced the jigsaw together. The details that had been passed down to the New Zealanders through the generations all fitted with what I knew about Grace’s London life. Although she had adopted another name in New Zealand, this was indeed the same Grace Oakeshott that I was interested in. But how, over a hundred years later, could I build a sense of the person she had been, of her values, relationships and aspirations? How do you find someone who has set out so deliberately to disappear? Most of us have drawers and cupboards cluttered with family memorabilia (photographs, letters, certificates, diaries) that our own families have accumulated. It’s the place most family genealogists begin. Grace’s New Zealand family were unfailingly generous and supplied a number of leads but there were still yawning gaps. Much as I longed to find them, Grace left no diaries, no letters written on a beach in France, and there was no formal record of her ‘death’ either. In England, she left behind a husband, Harold, but there were no children and I was well into the research before I managed to locate Harold’s descendants from his second marriage. To my huge surprise, his granddaughter had inherited Grace’s photograph album and it was full of portraits. Though we still can’t be certain who all the people are, I won’t forget my feeling of amazement that Grace, despite her best efforts to erase herself, had somehow contrived to leave this album behind. Had she meant to? Did she want to leave Harold with this pictorial record of her early life? It’s impossible to know but finding it was both a joy and a provocation because the photographs raised more questions than they answered. Eventually, I also tracked down some descendants of Grace’s first family, those she had left behind in England in 1907. If you are researching and writing about your own family, you have of course a sense of entitlement. You are an insider. As before, I felt apprehensive about approaching Grace’s relatives. How would they respond to me, a total stranger? But I was excited, too, and once again I was lucky. Drawing on the family’s recollections and their unpublished papers which they kindly shared with me, I was at last able to construct some understanding of Grace as a person, and of those closest to her. Of course, there are still gaps, as in any true story, but over the last seven years, I have ridden a rollercoaster and found out much more than I ever expected to. 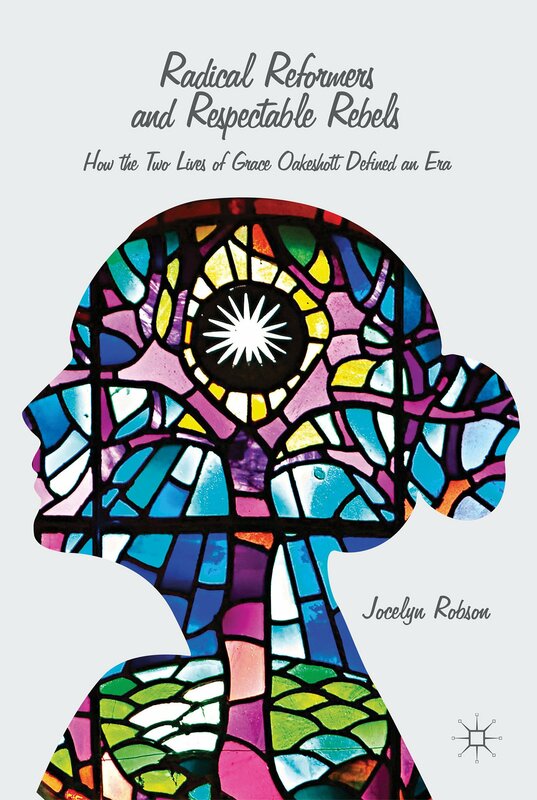 Radical Reformers and respectable rebels: how the two lives of Grace Oakeshott defined an era by Jocelyn Robson was published by Palgrave in February 2016.